Nan Fung Place is celebrating Chinese New Year in a new and responsible way this year by launching an upcycling red packet concept, in collaboration with Redress, a pioneering Hong Kong based charity working to reduce textile waste in the fashion industry and award-winning sustainable designer Janko Lam, Nan Fung Place has created red packets made of upcycled fabric, bringing new life to the unused fabric. Due to an overwhelming response to our shopping privilege programme, “Nan Fung Place x Redress Limited Edition Mandarin Collar Red Packets” are no longer available. 1. Promotion period is from 16 January 2019 to 4 February 2019 (both dates inclusive). 2. All gifts are offered on a first come, first served basis, while stocks last. 3. Each eligible transaction is entitled to a maximum of ONE redemption. 4. Customer(s) must present maximum two same-day electronic sales receipts with corresponding credit card slips issued by the retailers from Nan Fung Place to receive this offer. 5. Cash payments, cash vouchers and merchant gift vouchers are not eligible. Only Octopus, EPS, Credit Card, Union Pay, Apple Pay, Android Pay, WeChat Pay or Alipay payments are entitled to the promotion. 6. Valid receipts will be stamped by Nan Fung Place after redemption. Out-dated, duplicate, re-printed, damaged, photocopied and hand-written receipt(s) are not acceptable. 7. Customer(s) are responsible for inspecting the gift(s) upon redemption. Redeemed gift(s) cannot be returned or exchanged or redeemed for cash. 8. In case of disputes, Nan Fung Place reserves the right of final decision on all related matters. Keen to go green this Chinese New Year? Just in time for the holidays, Nan Fung Place has teamed up with Redress, an environmental charity working to clean up the fashion industry, to create eco-friendly lai see packets made from upcycled red fabric. 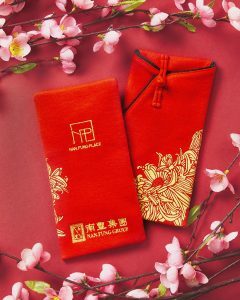 Not only do the limited-edition Mandarin Collar Red Packets curb textile waste, but they look beautiful too. Designed by Janko Lam – a Hong Kong-based sustainable designer and Redress Design Award winner – the eye-catching red packets channel Hong Kong’s cultural heritage, sporting mandarin collar-inspired folds inspired by traditional qípáo dresses. Most importantly, these versatile packets can be reused long after Chinese New Year celebrations fade in the rearview. The thoughtful, multi-purpose functionality easily doubles as a case for your mobile phone, name cards, makeup, stationery, and more. 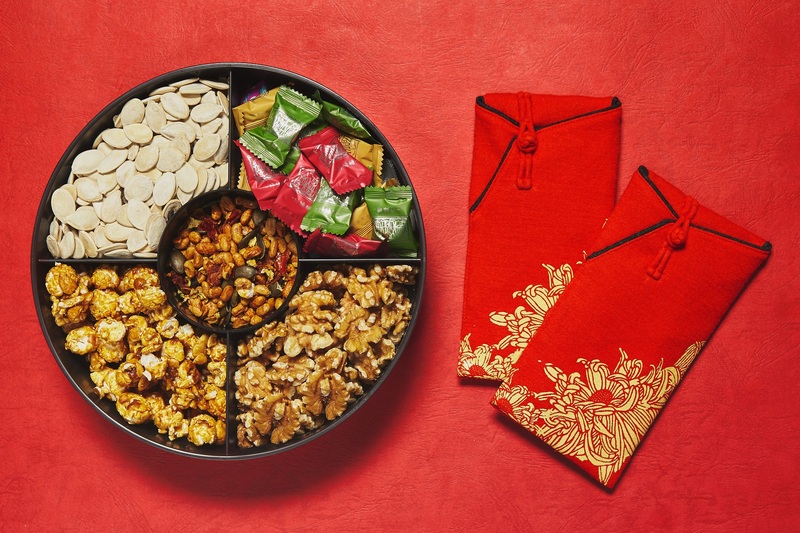 Start the “Year of the Pig” on the right foot with an array of healthy snacks from Green Common, such as oolong-tea roasted pumpkin seeds or Chinese New Year cakes made with sweet potato and brown sugar. Continuing the sustainable spirit, Nan Fung Place also serves as a one-stop shop for nutritious, eco-friendly snacks, should you be adopting healthier habits in the “Year of the Pig.” For instance, ever-innovative grocer Green Common offers a slew of plant-based treats that the whole family will love. 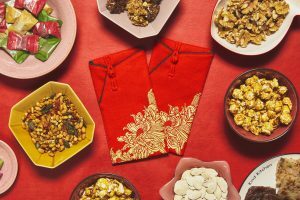 Try the oolong-tea roasted pumpkin seeds, water chestnut cakes with chrysanthemum buds, Chinese New Year cakes made with sweet potato and brown sugar, and red quinoa turnip cakes with revolutionary meat-free Omnipork. From aerial yoga to tailor-made training programmes, take your fitness to the next level this year with help from the experienced trainers at Fitness First at Nan Fung Place. Keep your lean, green resolutions going with a visit to Fitness First at Nan Fung Place. The gym’s experienced trainers can create tailor-made training programmes based on your fitness level and personal goals. Prefer group classes? From Aerial Yoga to Muay Thai Pro, TRX suspension training, Flow Yoga and Signature Pro Cycling, the gym’s wide array of classes and state-of-the art equipment will keep you motivated all year long. 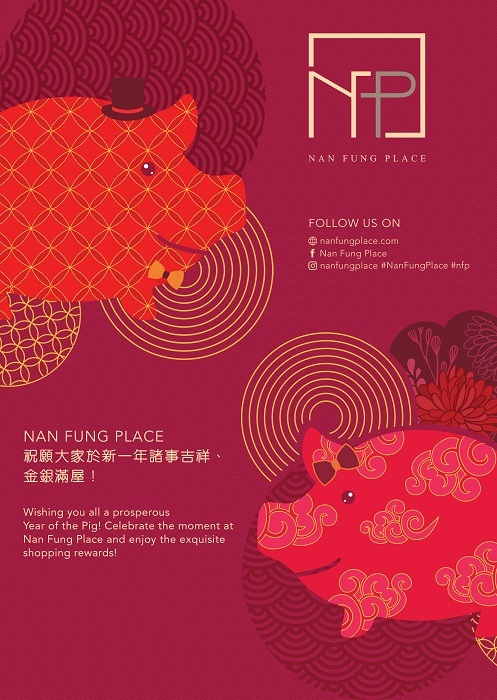 To kick off the “Year of the Pig” in a sustainable way, check out Nan Fung Place’s official Facebook page. You’ll discover more healthy snacks and fitness inspiration, plus learn how to redeem an upcycled Mandarin Collar Red Packet by spending HK$1,200 or more at Nan Fung Place while supplies last. * *Terms and conditions apply. Shopping Privilege 2019.01.16 - 2019.02.04 | 12:00 n.n. - 8:00 p.m. Spend a designated amount* by electronic payment in a single day, and “Like” NFP Facebook page or “Follow” NFP Instagram account, to enjoy the following rewards#: Due to an overwhelming response to our shopping privilege programme, "Nan Fung Place x Redress Limited Edition Mandarin Collar Red Packets" are no longer available. Redemption Venue: Nan Fung Place Concierge Terms & Conditions: 1. Promotion period is from 16 January 2019 to 4 February 2019 (both dates inclusive). 2. All gifts are offered on a first come, first served basis, while stocks last. 3. Each eligible transaction is entitled to a maximum of ONE redemption. 4. Customer(s) must present maximum two same-day electronic sales receipts with corresponding credit card slips issued by the retailers from Nan Fung Place to receive this offer. 5. Cash payments, cash vouchers and merchant gift vouchers are not eligible. Only Octopus, EPS, Credit Card, Union Pay, Apple Pay, Android Pay, WeChat Pay or Alipay payments are entitled to the promotion. 6. Valid receipts will be stamped by Nan Fung Place after redemption. Out-dated, duplicate, re-printed, damaged, photocopied and hand-written receipt(s) are not acceptable. 7. Customer(s) are responsible for inspecting the gift(s) upon redemption. Redeemed gift(s) cannot be returned or exchanged or redeemed for cash. 8. In case of disputes, Nan Fung Place reserves the right of final decision on all related matters.